TJ’s Salsa Wars: Which Trader Joe’s salsa is the best? Hey there! For more fabulously healthy foodie posts, enter your email and name in the box below! 🙂 Agree with the statement below? "Yes, Kammie, I am a healthy foodie too! Send me stuff!" I was very happy to see that you guys found my Energy Bar Wars post from a whiiile back as helpful. I’ve had an idea to do more than one of these “wars” posts and there goes another one! This time I decided to review a few different salsas – yeah, these are all from Trader Joe’s (obviously, it’s pretty much the only place I grocery shop). Again, this review is mostly done based on my own preferences, based on taste mainly – I went for the all-natural picks, therefore nutritional facts are usually very similar from one brand to another. The ratings are done out of 5 stars for each. I am a total salsa freak – seriously, I use it on everything: eggs, wraps, salads… pretty much anything that isn’t sweet, I’ll use salsa on. It’s a great flavor kick to an otherwise boring dish, or it can make a fun dish EVEN more fun! I also love that Trader Joe’s has so many different varieties of salsa! They are also all so affordable! It’s awesome. 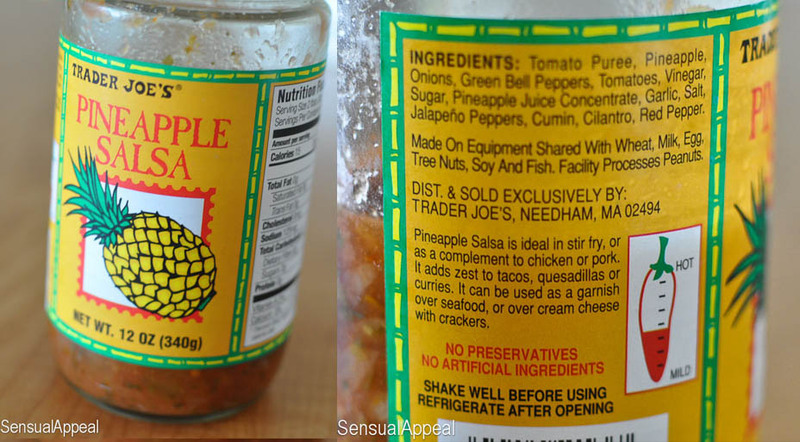 TJ’s Pineapple Salsa – I love this salsa. It’s freaking delicious. It’s not that spicy but it has a nice sweet/spicy kick that I love. Pineapple isn’t really that apparent in the taste but it does sweeten the salsa up, or maybe that’s the added sugar in there… I would absolutely give this salsa a full 5 star rating if not for the added sugar it contains. Granted it’s not a lot and it’s the 6th ingredient, but I honestly don’t think it’s necessary to put added sugar in a salsa, especially when it’s already being sweetened by the pineapple and pineapple juice concentrate. Sigh, oh well. Because of this fact, the salsa does not frequent my fridge as often as I wish it could. TJ’s Habanero and Lime Salsa – This has been my favorite salsa for a while now. And I would gladly give it all 5 stars until I actually took the time to read the label and realized that there is added sugar in this product. Such a disappointing realization. I really thought this was going to be “the one”. While I’ll still buy it once in a while, I really want to try to cut out as many unnecessary added sugars as possible so this salsa won’t be frequenting my fridge as often as it used to. The flavor is delicious – it’s perfectly spicy. It’s actually quite a bit spicier than I’m used to but the sweetness of the carrots (and sugar, I guess?) combats it and together it creates a deliciously amazing flavor. The taste is complex and really fun. I recommend it for anyone that wants to change things up. TJ’s Hot Chipotle Salsa – So this one is weird. At first taste, I almost spit it out. I guess I’m just not a big fan of the whole “smoky” taste and flavor. Oh my god, I thought, this is going right in the garbage. But I put a good 2 Tbsp on my morning eggs and I had to eat it, I wasn’t going to throw away my breakfast when it was almost time to leave for the internship. I had another bite and… something changed. The flavor grew on me the more bites I took. After a few, I loved the flavor. The smoky taste was strange and foreign to me at first but eventually it became interesting and fun. While I wouldn’t buy it too often, I think it will make a reappearance in my kitchen. Plus, there are no added sugars in it so that makes it just that much better. TJ’s Roasted Garlic Salsa – To tell you the truth I bought this salsa but I didn’t really want to try it. I like garlic flavored things as much as the next girl but for some reason I just didn’t think this salsa would taste good. I didn’t want an overly smokey and garlicy breath after eating so I was scared. But I tried it. And wow thank God I did. This is my favorite salsa so far. It is slightly spicy; the garlic flavor is not overpowering and it is subtly smokey… all perfect combinations to make one delicious tasting chunky salsa. It also has NO added sugars which made me very very happy. I am so coming back to this one! 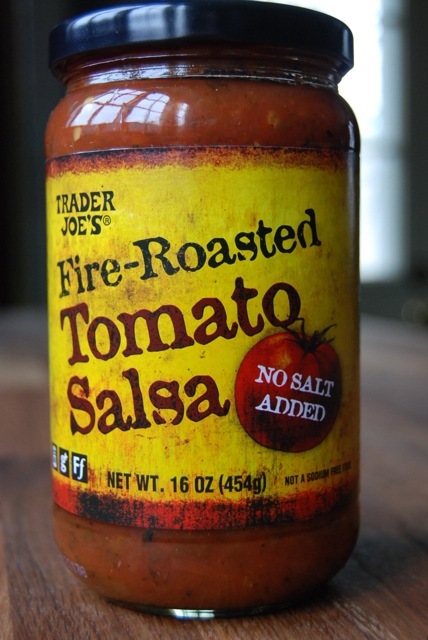 TJ’s Fire-Roasted Tomato Salsa – the first thing that I love about this product is that it has no salt added. But then again, salt isn’t a big concern for me because I have low blood pressure (my own doctor said I can eat more salt haha you don’t hear that every day eh?). I like this salsa but I found it to be too roasty for me. Also, the spicy meter indicates that it is only medium however I’d say it’s more like a hot one. The spicyness is much higher than some of the others I tried. Do you prefer mild, medium, or spicy salsas? I love there salsa. I love spicy foods, but oddly enough I love there chunky salsa. I add it to alot of my meals!! The Habanero and Lime is also one of my favorites!! Rosted Garlic is my absolute fav!!!! I had been getting the Fire Roasted for quite some time and then I did a sugar detox and the roasted garlic is the only one without any sugar or sugar substitutes! I put it on EVERYTHING. I’m a salsa freak. LOVE this post! I am such a salsa hoarder, too. It goes so good on everything and I especially love the garlic ones like Maria said! I buy all TJ’s salsa often and really love them all. the ONLY one I am not a huge fan of is the pineapple. When we spent our winters in WA state, I shopped at TJs all the time and used to go through jars and jars of the pineapple salsa. I love spicy hot salsas usually, but that one just really appeals to my tastebuds. Good review. TJs should thank you! I LOVE the fire-roasted salsa but in all honestly I haven’t tried any of the other ones you showed. The pineapple one sounds delicious! Thanks for linking this in to Food on Friday. Great work. Have a super week. Use the garlic salsa with two boneless skinless chicken breast in the crockpot…makes the best shredded chicken you have ever had! 6 hours on low or 4 hours on high. I am also a salsa fan, but you didn’t mention one of my favs…corn salsa. It’s really chunky but I still like it. I admit thoughthat it’s not as versatile as the salsas that you mentioned and it might have added sugar too. All in all though it was a good review and you hit all the points that I have been recently looking at to narrow down the types of salsas that I plan to use in the future. Thanks for stopping by, I’m glad you liked the reviews. I don’t eat very much corn so that’s why I didn’t review that one, I know I wouldn’t normally buy it. Love, love, love the Pineapple Salsa. It’s my favorite so far, and although I know the added sugar probably isn’t good for me, I know in all salsas it cuts down on the acidity so I use that as an excuse. I’ll have to try the garlic one now because of your rating! If you love salsa, ya gotta try these flavors!!!!!! Absolutely AMAZING!!!!! !